Frame Slip: Sets the vertical position of the frame – ranging from -100 to 100. Jitter: The vertical distance that the ‘film’ jumps up and down. Vary Jitter: The maximum amount the value for Jitter can randomly change from the set value. 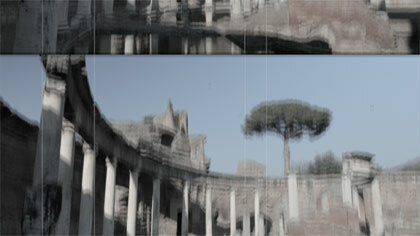 Focus: How blurred the film can be. Vary Focus: The maximum amount the value for Focus can randomly change. Vary Brightness: The maximum amount the value for Brightness can randomly change. Saturation: How colourful the film is. 1: Image doesn’t have colour added or taken away. Vary Brightness: The maximum amount the value for Saturation can randomly change. Scratches: How many scratches are added to the film. Scratch Colour: The colour of the scratches. If you turn down the reveal arrow for this control you can also choose the opacity of the scratches. Grain: The amount of each material added to the clip. Frequency of Variation: How often new random values are chosen for parameters that are varying. The lower the number, the more often new values are chosen. Random Seed: Although the distribution of varying values and overlaid content seems completely random, they are determined by a single ‘seed’ value. 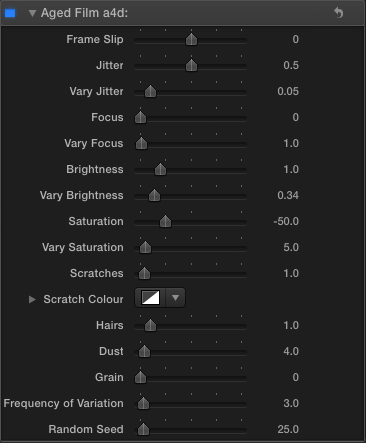 If would like exactly the same distribution for every clip given the same settings, keep this value the same. If you’d like the scratches, hair, jitter etc. to look different using the same settings, change the value of the random seed value. 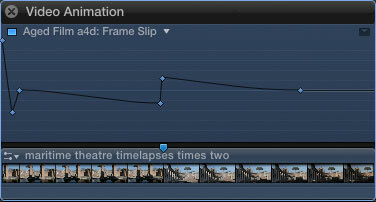 In this case the frame jumps at the start of the clip and slowly slips to a new negative value (the frame slips downwards) before instantly changing to a positive value and gradually slipping back to zero. 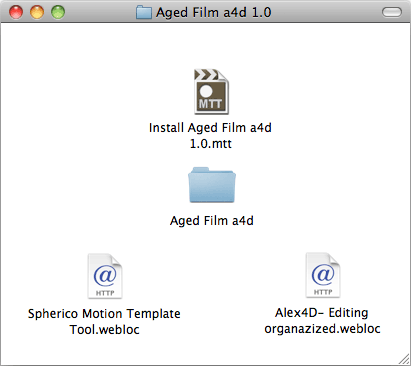 Once you have MTT installed on your computer, double-click the ‘Install Aged Film a4d 1.0.mtt’ file. Follow the instructions as listed in the ‘Installation’ section. Installed but when I try and use it all I see is a blue screen over the clip. And it’s not giving me the controls from up above. 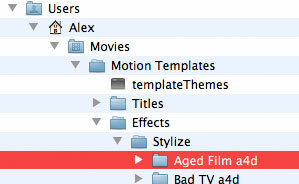 That’s a symptom of your version of Final Cut Pro X not new enough. Go to the Mac App Store to download the free update. thanks for the plugin! found it very helpful! Hi, I installed the plug in but when I put the effect on a clip I can’t have access to the controls. Do you know where I did wrong? is it a matter of the old version of final cut 10.0.1 as Charles faced before?